What a Great Christmas!!!! Sorry I've been scarce, but I've truly enjoyed my time with Family and Friends this year! This week at TPE, we have TWO sketched for you to choose from! I chose the first Sketch!!! 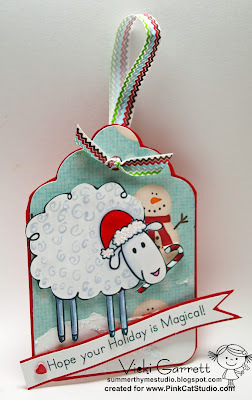 Our Sponsor for this week is Totally Stampalicious! This set is called Snowmen. 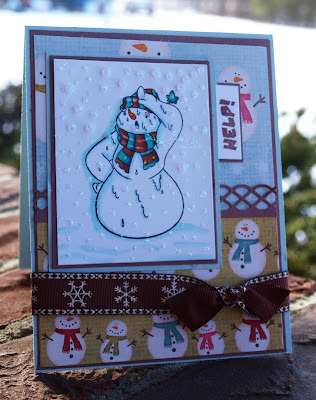 A very cute and versatile set, this guy is looking for MORE snow!!!! The sentiment says "Help, I need a higher SPF". 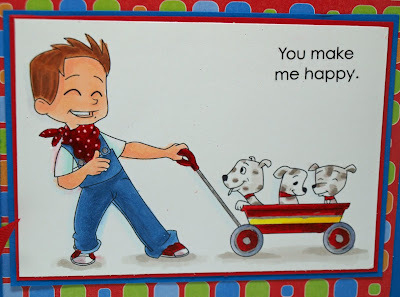 I stamped the remainder of the sentiment inside my card! 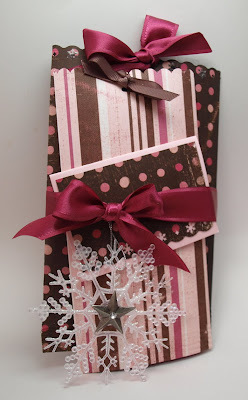 The DP is Basic Grey Figgy Pudding with a base of Pale Blue Cardstock and a Medium Brown. The Border Punch was a great find! It's a Martha Stewart punch and I got it at M's yesterday for 70% off!!! I love a good bargain! 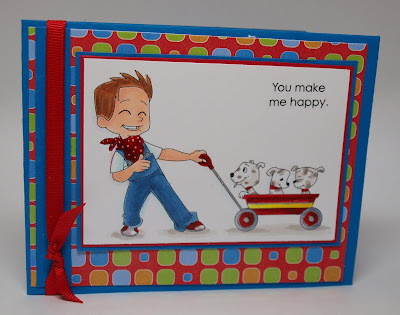 Hop on over to The Pink Elephant to see the great DT creations and to get the scoop on how you can win some Totally Stampalicious Stamps! Happy Stamping and I'll see you soon! 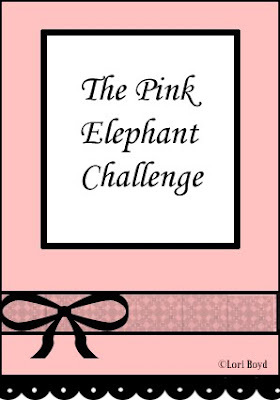 Today's Challenge over at The Pink Elephant is a Sketch Challenge!!! Our Sponsor this week is InStyle Stamps! Early this year, I had the fabulous opportunity to be a Guest Designer for Virginia and really enjoyed working with InSTyle Images, so I am very excited that they are our Sponsor!!! 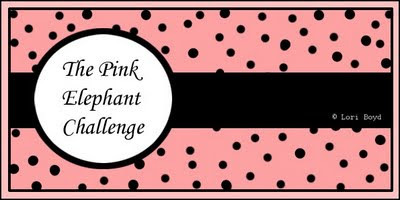 If you'd like to play along, please see all the details over at The Pink Elephant and don't forget to click on the links on my sidebar to see the Fabulous DT creations! My Candy Making has been cutting into my Stamping time a little, but I'm happy to say that between my Candy and my Mom's yummy cookies, our friends and family will have full tummies this Christmas! It's sure been difficult trying to stay away from the treats!!! 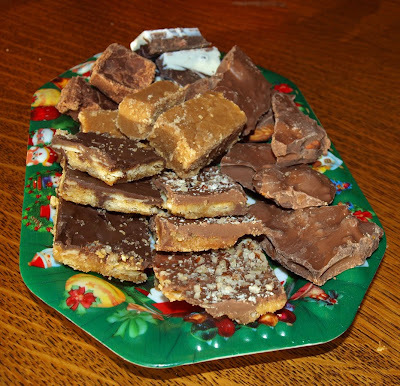 I placed them out of sight and mind in the cold storage cupboard, but every once in awhile, I'd stray in for a little sample.....I had to make sure that they were still good enough to give away!!! 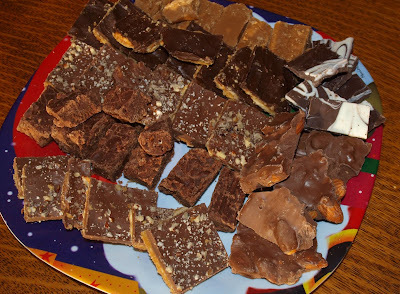 I made Almond Toffee Bark, Candy Cane Bark, Brown Sugar Fudge, Chocolate Fudge and two types of Saltine Toffee Bars. Oh yes and the Spider Cookies that you see on the Cookie Trays are also my project!!!! I specialize in Chocolate! One can never have enough! Does this look tempting or what? 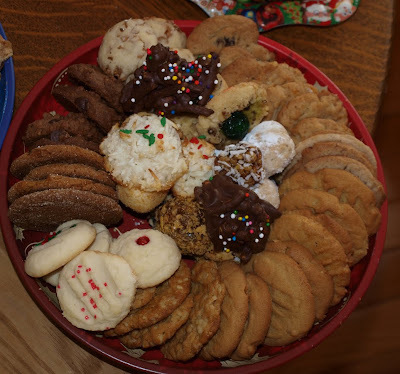 Each year, my Momma makes dozens and DOZENS of Cookies. 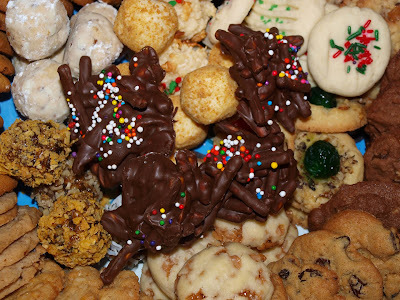 Made with love, they are perfectly uniform, with each cookie being almost the same size. 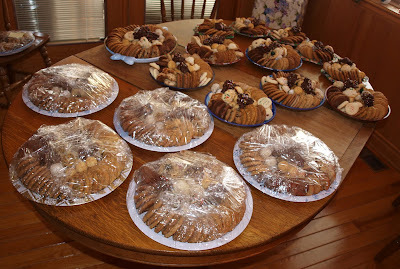 I took these shots this morning when we were assembling the trays.....and I must say I was very disciplined, with only one cookie making it into my cakehole today!!!! lol! 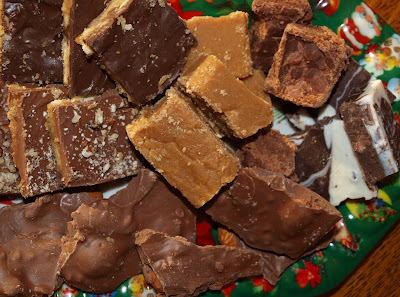 Dutch Nutmegs, Skor Cookies, Swedish Pastry with Cherries, Hermits, Dateballs, Cherry Winks.....see those Chocolately ones.........yep, My Fave......Spider Cookies-Peanuts and Chowmein noodles ensconced in melted Chocolate and Butterscotch chips!!! !.......Hmm I think I covered them all. Now all thats left to do is some cleaning! The gifts are purchased and wrapped, the Christmas Cards mailed out, enough baking to feed half of Kingston..........just to tackle those dust bunnies.......ohhh I DO NOT like cleaning one little bit!!! Think I better ask Santa for a hunky Man Maid this year!!!!.................. I'll pay him in Cookies!!!! Wishing you and your family a Merry Christmas. Whatever Holiday you celebrate, may it bring you Happiness and Health and warm memories with your families. Now remember, when you play along with us you will want to come back to the blog post on Crazy4Challenges and sign in with Mr. Linky so others will be able to find your creation to gaze upon. I got my inspiration......well actually totally Cased my idea from the awesome Gift Packaging that I saw on Joycelyn's Blog a couple of weeks ago. They are Treat Pull Bags and a gift card holder. Presents for the Teens in our family........ I totally took Joycelyn's advice, bought some Theatre Gift Cards and packed the gifties with Popcorn and a HUGE chocolate bar~~ Thanks J! I can check one more things my list! 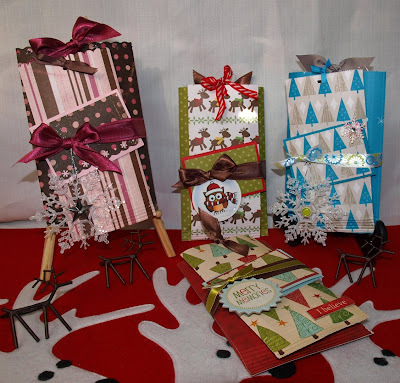 I am lovin' this Imaginisce Christmas Paper! The Little Reindeer are Stinkin' Cute. The Green dotted Paper is from last years Peppermint Sticks October Afternoon. Q.T. Hootie is from Pink Cat Studio and coloured with Copics. This Girly pack uses Paper from Bo Bunny a Gift of Love collection. The Snowflake is from the Dollar Store and the Star Brad from Creative Imaginations. How about this Scenic Route Combination? This is last years Christmas Line. 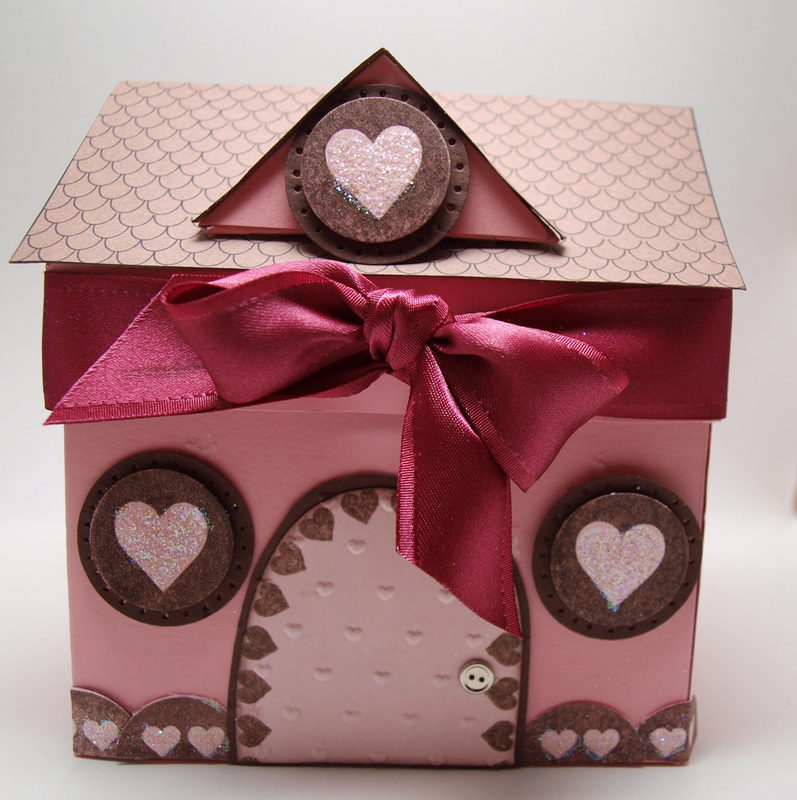 I got a great deal in the Spring on a combination kit of Paper, Chipboard and Stickers! 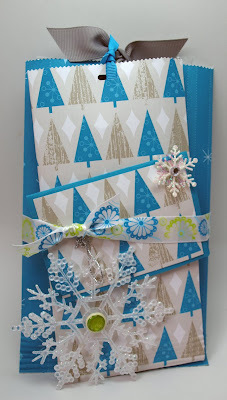 I like the bright and whimsical look of this paper! I have to tell you, that this was such a quick and easy project! I completed all four packages in just over an hour! 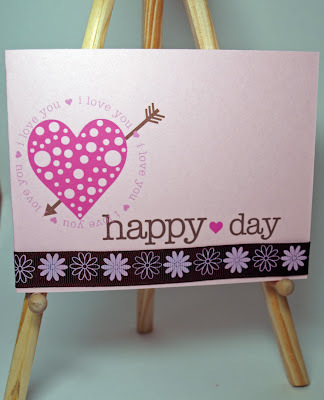 If you have time to...........Stamp Happily! I needed to create a wedding card for my mother (nope, she's not getting married again......been married for 47 years now.......isn't that a record??) as she is attending a wedding shortly. These cute little images from Our Craft Lounge Bird and Groom were perfect for creating a whimsical wedding card. 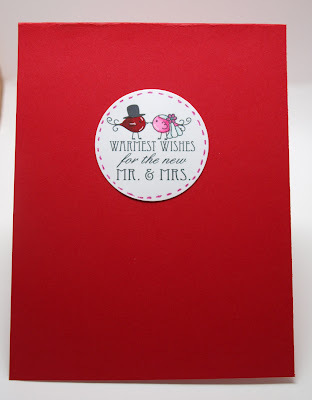 Leave it to me to veer away from the traditional elegant card!!! lol.......I'm still working on elegant!!! Anyway, it's a pretty simple card! Not much to the layout, but fun and funky I think! See you later this week and hope you're all getting close to being ready for Christmas! 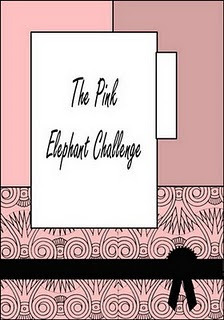 I missed the Kraftin' Kimmie Saturday Challenge this week and decided to combine The Pink Elephant Challenge with Kraftin' Kimmie! 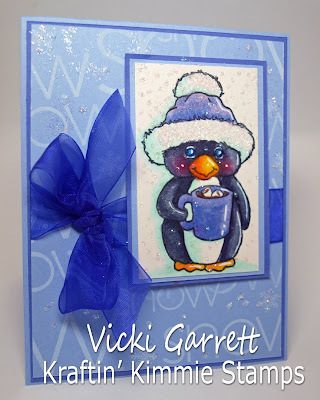 The Theme for this weeks Pink Elephant Challenge is to create a winter themed card. 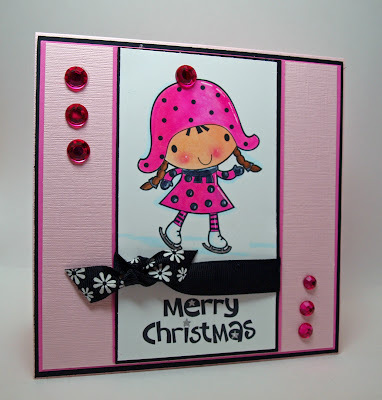 Kraftin' Kimmie's Challenge was called Sparkle Baby, to pimp up your card with lots of Bling! 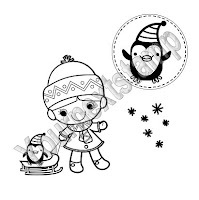 Oliver is a perfect winter image and I think he looks pretty cute all glittered up! Here is the scoop on how to play the KK Challenge! I copied it directly from the Challenge blog! 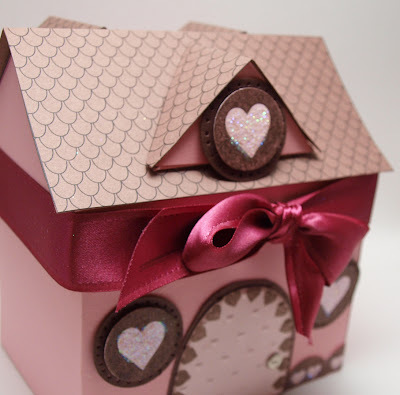 This week our hostess is Krafty Girl Andrea and the theme is Sparkle, Baby!! Let's see that bling, that glitter, those rhinestones and stickles! Whatever you've got that's shiny and glittery, use it on your design!! Then leave us a comment and you could win lovely girl Josephine, as featured on Andrea's sparkly card!!! If you upload your creation to an online gallery, such as Splitcoast (where Kraftin' Kimmie Stamps now has their OWN section....teehee), please be sure to use the keyword KKSC10, so we can all go check them out!! Don't forget to follow the links on my sidebar to see The TPE winter creations, which by the way are STUNNING and to see what some of the Krafty Girls whipped up for you this week! I'll probably be fairly sporadic with my posts in the next couple of weeks! Lots going on getting ready for Christmas! Welcome to Week 15 of the C4C challenges. This week we are going to play withSNOW!!! 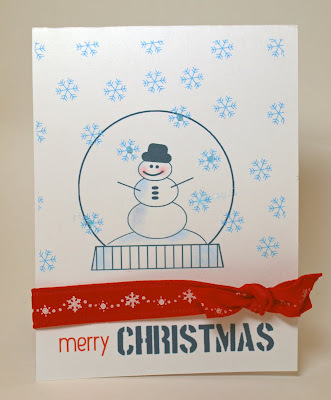 Getting in the winter/holiday spirit, we are going to make cards (or other creations) with snowmen and/or snowflakes. For those of you still working on holiday cards, this will give you the chance to add another to your 'stash'. For those of you who have finished the holiday cards, this could be thank you cards, winter birthday cards, gift containers for any occasion, or, if you are truly ambitious, you could start on next year's stash. No matter what you make, it must involve snowflakes and/or snowmen. I had a lot of fun getting digi with it last night! I have been a little hesitant about experimenting with Brushes in my Photoshop Elements, but with a few tips from my good friend Jeanne Streiff, I was up and running fairly quickly. These are my first experiments with Digital Cards, so if you're chuckling, I can truly appreciate that. 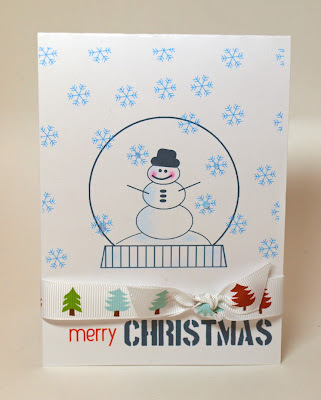 I whipped up some quick and simple Christmas Cards, only adding Ribbon, a little chalk to the Snowman for shading and some stickles to add a wee bit of bling~! 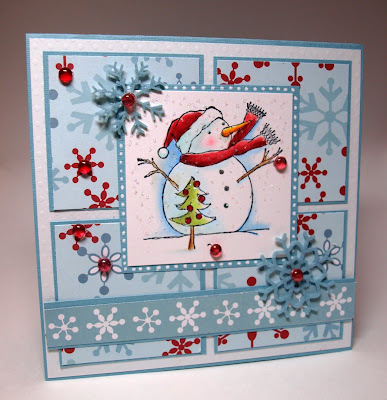 All images are digital and are from Joy2Christmas and Love2Hug the November and December Releases from the Stamps of Life. Both sets also come in clear mount stamps! Well I better run, it's blizzarding out........snow day for the kiddies, but I have to teach this morning! 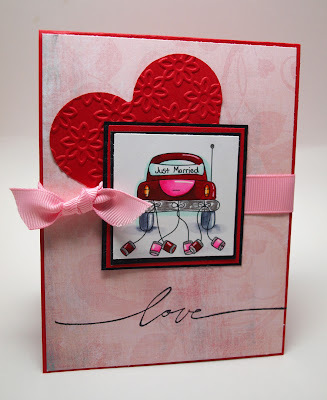 Keeping it Simple is the Objective of the Totally Stampalicious Monday Challenge! 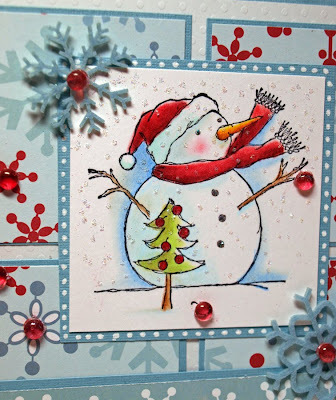 Now that we're getting down to the wire for Christmas, there's probably less time for stamping, blog surfing and if you're stamping, it might be your last minute dash to get those Christmas cards or gift items created.........lol........ I am working on a couple of Albums at the moment and I am keeping my fingers crossed that they'll be done in time! 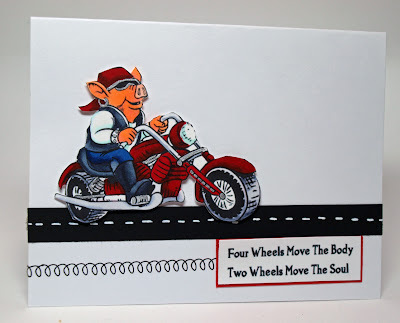 Anyway, I whipped up this card in a Jiffy, using the Road Hawg set. 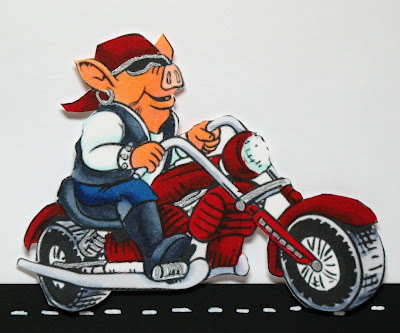 I coloured the Hawg with Copics, cut him out and mounted him on dimensionals over a plain black strip that I lined with white gel pen to create a road. A little rub on, filled in the white space to the left of the sentiment. Did you know if you play along with the challenge, you could be the winner of a $10.00 Gift Certificate to the Totally Stampalicious Store? Visit the Challenge Blog HERE for all the deets! Good Morning! Sorry my post is late, but I woke up earlier with a wicked migraine and headed back to bed for a bit! I'm going to keep this short and sweet and essentially copied the information directly from TPE site. Here's my Christmas Col0ur Combo. I can't say this is truly my Favourite Colour Combo, but what I enjoy when making Christmas cards, is making unusual, or non traditional coloured Christmas Cards. I don't think I have one red and green card in my stash......well maybe one or two, but for the most part, I'm not a fan of that combination. 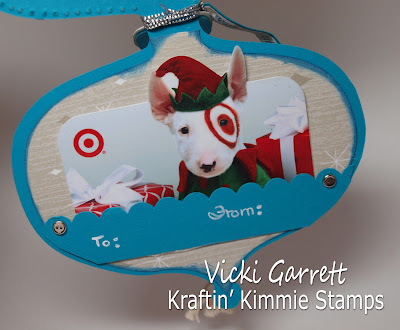 Crazy 4 Challenges with Kraftin' Kraftin' Kimmie's Challenge too! 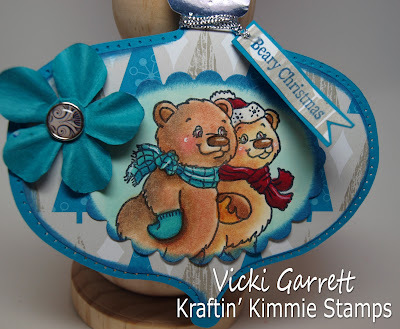 This week I am combining Crazy4Challenges week 15 with Kraftin' Kimmie Challenge no. 9. 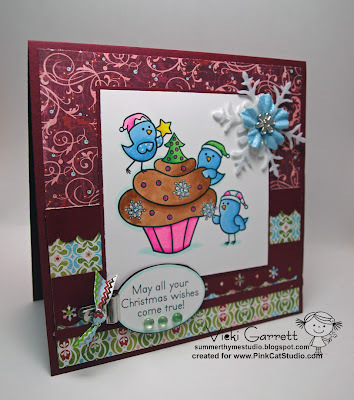 I happen to be the Hostess this week for Kimmie's Challenge, so one random player will win the Ozzie and Harriet Stamp! How cool is that! So both Challenges are to create a gift card holder. 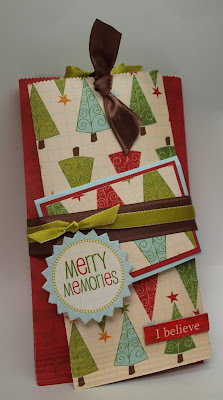 I looked at various templates and decided just to make my own, using my Cricut and the Christmas Cheer Cartridge. I cut two Ornaments out and just scored them at the bottom of the Silver Fob and glued them together. I cut smaller layers out of Designer Paper to create some contrast. The images are coloured with both Copic Markers (Mitten......lol..........Ozzie should probably be renamed to Michael, due to the fact he's only wearing one mitten! I realized my mistake after ai coloured it, but was happy with the image and decided really, that Ozzie wanted to feel Harriet's pretty paw in his own! Scarf, Hat and Background). The Bears bodies were coloured with Prism Pencils as I like the Transparency I can achieve with the pencils. I inked the edges of the DP with A dark teal craft ink. Here's the inside of the Gift Card. Perhaps it's a little primitive, but I like it anyway!!!! Okay so here's the deets on the Challenges! Just have fun in the presentation!!! No pressure...just have fun!!! 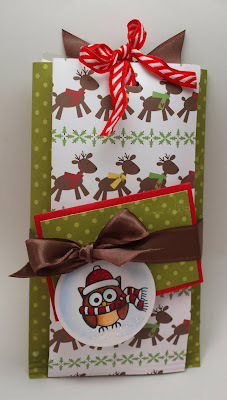 It could be a version of a card, a packaging design, a 'purse', a holiday ornament gift card holder!! Whatever suits your fancy or need is what you should 'play' with.....and, no, it does not have to be holiday related. It could be for any occasion!!! That is one of the great things about this team. We want your creative juices to flow freely, not confined!!!! Our sponsor this month is........ Being the first Challenge of the Month, this is our Prize Challenge. One lucky person will win the Butterfly Wishes set which was designed in collaboration between The Greeting Farm and our very own Jessica Diedrich. The winner will be announced next week when we post our new challenge. As I said, I am the Hostess for the Kraftin' Kimmie Challenge! Head on over to the Challenge Blog to get all the deets on how to play!!! Lastly, don't forget to visit the links on my sidebar to see both Design Team's creations......you'll enjoy the surf for sure!!! 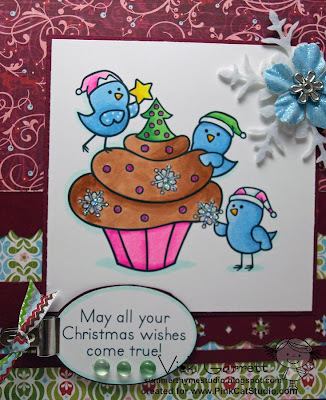 These little birds are getting ready for Christmas, making pretty Christmas Cupcakes!!! It's Pink Cat's Thursday Digi Release and the images are just fabby today!!! Here's the picture of the entire release! Don't forget to follow the links to see what the digi chicks have designed for you this week!!!! Stephanie has come out with an adorable stamp set this month! 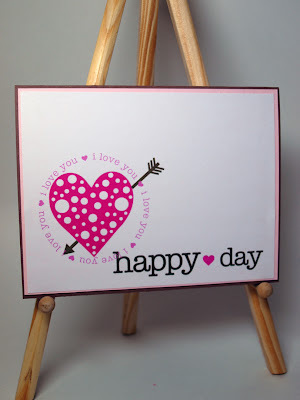 Love2Hug has so many adorable images that are extremely versatile in making Valentines/Love Cards and Projects. One thing I love about Stephanie's Stamp sets is that they allow you to create projects quite quickly. 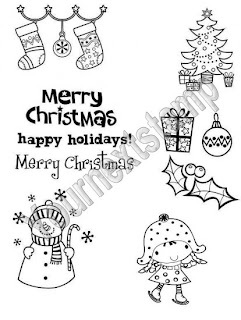 These images are also available in Digital and Brushes, which are perfect for resizing, digital scrapping and other crafty projects! Watch for more SOL designs throughout the month!